The debate lingers on . . . what effect does a brewer’s choice of bittering hop variety make on the final beer? Let’s find out! A few things before we get started as the new authors of this column — in case we’re strangers. One of us is a mad scientist amuck in the world and the other is a scientist mad at a world gone amuck. We’ll let you decide which of us is which. But here’s where we come together — in a world made pressure crazy by all the demands put on us by work, family, friends, etc., the last thing we need to be worrying about is our beer making. This is a hobby and if we wanted to be stressed out while spending precious time on a frivolous activity, we’d take up golf! If you’re reading this, you’re a rare bird . . . a pelican dedicated to the idea of making your fish stew instead of settling for the catch of the day. You’ve probably spent time reading books, watching YouTube videos, listening to podcasts (Find Experimental Brewing on Apple Podcasts, Google Play, Stitcher, Spotify or your favorite podcast source. What? . . . a little harmless self promotion never hurt anyone!). Your head is swimming in approaches, techniques, calculations, and science. Well, we hope to rescue you from some of that. Science is great, and we couldn’t live or brew without it, but one of Denny’s favorite sayings (from the late Tom Magliozzi of Car Talk), is ”Reality often astonishes theory.” In other words, start with science, but don’t trust it. See how it works out for you! What we intend to do with this column is give you ways to make the best beer possible, with the least effort possible, while having the most fun possible. After all, we’re homebrewers and if you’re not having fun homebrewing, you’re doing it wrong. And always remember, malted barley WANTS to become beer. All you have to do is give it a bit of help, then get out of the way. Now you’re either excited or scared. Either way is OK with us, because it means you’re gonna stick around to see what happens next! Just remember, we’re going to be lighter on the “Do it this way” and heavier on “Try it yourself and see what you think.” After all, it’s your beer. You get to decide. One question we get repeatedly is “does the variety of hop used for bittering make a difference?” Some people, like Drew, seem to think not and tend to use a few hop varieties for pretty much all their bittering. Magnum, or some other “neutral” variety, is very popular among that group. Others, like Denny, think that you get different bittering qualities from different hops. For instance, bittering an American IPA with Magnum will give you a different type of bittering than bittering it with Chinook. So what’s going on and who’s right? Or does it simply come down to personal preferences in the bittering qualities found in beer? Pretty much every homebrewer knows that the alpha acid content (AA) is the main factor in bittering beer — but that’s not all there is to it. The other thing that’s hotly debated in homebrewing circles is how much, if any, of the bittering hop’s flavor characteristics come through in the finished beer? Traditionally it was thought that it was none, so you could use any hop for bittering. More recent thinking questions that line of thinking. Pretty much every homebrewer knows that the alpha acid content (AA) is the main factor in bittering in beer — but that’s not all there is to it. You’ve got isomerized alpha acids, which directly contribute to bittering in the way most of us think of, which are created during the wort boil. But there are also “plain” alpha acids, which contribute to measured bitterness values, although no perceptible bittering. Then there are humulinones, oxidized alpha acids, which are slightly bitter but don’t contribute to IBU measurements in any clear, straightforward linear fashion. No, seriously, the whole thing is odd. Higher alpha, lower cohumulone hops were once thought to make for a smoother quality of bitterness, but more recent research has shown that cohumulone is simply more efficiently utilized than humulone. Because of that efficiency, you get the same amount of bitterness from a smaller amount of high cohumulone hop. This leads to the perception of smoother bitterness in high cohumulone hops. In other words, by using fewer pellets you reduce the other bittering compounds as well as the amount of astringency contributed by the hops. Makes your head spin, huh? Remember earlier when we said Drew likes using neutral high alpha acid hops because, in part, you need smaller doses? Here’s why. One of the big impacts of the vegetal matter in the hops is a massive tannin contribution. In the wine and cider world, tannins are used to provide structure and bitterness. (For instance, in cider making “bitter” apples are high in tannins.) In addition, that vegetal matter has an effect on the flavor the hops contribute. This tannic contribution to bitterness became abundantly clear when we brewed with two new products from Yakima Chief Hops — Cryo Hops® and American Noble Hops™ pellets. Cryos are made with a proprietary process (think liquid nitrogen, hops, freezing, and shattering — SCIENCE!). They sift the hop powder and separate the lupulin glands from the leaf matter. 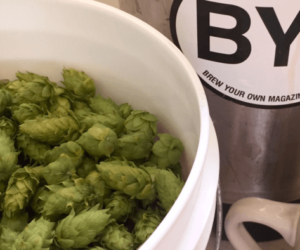 The pellets with concentrated lupulin and hop oils becomes the Cryo Hops®. The remaining vegetation, which still contains flavorful compounds but with low bittering potential, becomes American Noble Hops™ pellets. Special note: These are not noble hops in the classic European sense. They are American varieties, like Loral® or Citra®, which after processing mimic some of the characteristics of continental noble hops — low bitterness, and a low but “laid back” aroma (that’s the best way we can describe it). The American Noble Hops™ pellets smell like American hops — citrusy, piney, fruity as opposed to the European spicy tones. We knew what to expect when we first tried the Cryo Hops® — we’ve mainlined so much hop oil and lupulin that we could feel in our brewing bones that we’d be getting a turbo boosted hop experience. The American Noble Hops™ — with their more attenuated alpha acid (2–3% AA versus 20–27% AA in Cryo Hops®) and hop oils — were a complete unknown. It turns out that tannin component provides a constant base note, a foundation to the higher tones and more aggressive flavors we’re used to. Let’s revisit that common refrain we’ve been taught as of recent years — “you should avoid bittering with low alpha hops, because all the extra vegetation affects the taste.” Many describe it as a muddying effect. But sometimes that kind of flavor is exactly what you’re after. Denny’s oft re-iterated American Mild recipe depends on that tannic flavor from the debittered hop in it to contrast the malt flavor with its subtle bitterness while allowing a soft, not-overpowering character from Citra®, Simcoe®, and Mosaic®. It really makes the beer a whole experience. In other words, the tannins in the hops actually can make a flavor contribution and fit with your recipe goals. And that’s kind of the key to anything in recipe design . . . don’t just put it in there . . . KNOW what you’re going to get from it before you use it. We’ll dig deeper into that in a future column, but for now here’s a pragmatic method to develop an opinion of your own. In other words, the tannins in the hops actually can make a flavor contribution and fit with your recipe goals. We start with our question. In this case it’s “Do different bittering hops produce different qualities of bitterness?” Then we go on to a hypothesis. “Bittering with Magnum will produce a smoother, less sharp bitterness than bittering with Chinook even at the same IBU levels.” Now how do we prove or disprove this? Here’s how we’d tackle it. Produce a batch of American pale ale wort. Nothing fancy . . . pale malt and maybe a touch of crystal malt in the 20-60 °L range. This doesn’t matter a lot since all batches will use the same wort. Split the wort in half. Bitter one half with Magnum and the other half with Chinook (you could try something like American Noble Hops™ here too). Make sure the amounts you use will create an equal IBU level. Boil both for the same amount of time and utilize the same cooling and fermentation process for each half. Remember, it’s important to keep everything but the variable under test as close to each other as you possibly can. Ferment to completion, then package each batch the same way, whether bottled, kegged, canned, etc. Once carbonation is complete, it’s time to taste and figure out what the heck you’ve done. This is where we use the triangle test. Gather your tasters. You’ll want at least a half dozen, more if you can get them. (Hey, this is a great homebrew club activity!) Your tasters’ experience level doesn’t matter as much as you’d think – so grab anyone with functioning noses and taste buds. If you’re going to be a taster, get someone else to pour the beer. Using opaque cups (of three different colors if possible for easy ID to the pourer), pour one of the beers into 2 cups and the other beer into the other cup. If you can’t get three different colors of otherwise identical cups, mark a circle, square and triangle on the 3 cups. Why not A,B,C or 1,2,3? Turns out that when you present tasters with labels that have an implied order it has an impact on what they choose, thus it’s better to go with something without a clear order. Humans and our senses are weird! Make sure you don’t give away the nature of the experiment to your tasters. When you give them the beers, ask them to answer the question “is one of these beers different?” You don’t want to give them any clues. A significance chart — in this chart, and for many experiments, we use the common p-value (probability value) threshold for significance at 0.05. Anything above that and the test is considered inconclusive (red zone). At that level or below, the findings would be considered significant (green zone). Of course, you’ll know one is different, so your own perceptions will be just a bit less valid than the blind tasters. From there, you just do what comes naturally — sniff, sip, taste, fret, and repeat until you decide which (if any) of the beers are different. Have each taster record (silently) their finding and what differences they’ve noted. After the tasters are done, count how many identified the correct beer. Divide the correct results by the number of tasters to see what percentage got it correct. If your percentage of correct identification is ~70% (for small sets of tasters, about 10–12), you have a pretty clear indication that your tasters noticed something! But if you struggle in the middle ground, we’ve included a handy-dandy chart. Notice how as the tasters go up, you need relatively fewer to show significance. Isn’t math nifty? And let us know what the results of your experiment are. Email us at edit@byo.com or results@experimentalbrew.com and tell us how your experiment went. We’ll compile the results. Single infusion rest for 60 minutes at 152 °F (67 °C). NOTE: whichever you use, be sure to adjust the amount to account for the actual AA of the hops.